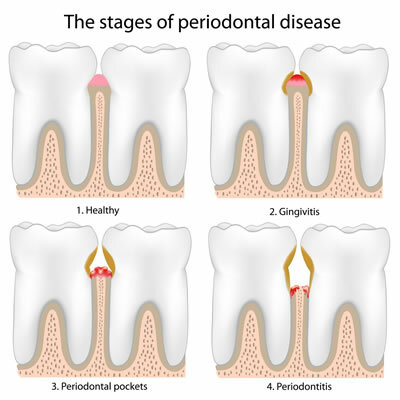 Periodontal (Gum) disease is an infection of the gums and bone that surround your teeth. Your hygienist and dentist will thoroughly examine your periodontal health using a periodontal probe (round ruler) to measure your gums, and x-rays to measure the bone around your teeth. When your dentist diagnoses periodontal disease, one of the treatments is scaling and root planning to remove plaque and tartar below the gum line. Your hygienist will treat you with the finest care using a topical or local anesthetic first to make you more comfortable. Our hygienists use the latest in technology of instrumentation to treat periodontal (gum) disease. They use piezo-electric scalers, which decrease sensitivity and increase comfort during the procedure. We will teach you techniques personalized for your needs to maintain excellent plaque control and oral hygiene at home. Your participation on a daily basis is critical in order to keep the healing ongoing. If upon re-evaluation some areas have not resolved, the next stage of gum treatment involving surgery may be necessary. Periodontal (Gum) disease will not go away by itself. Although the disease cannot be cured completely, with proper treatment it can be slowed, controlled and arrested. Unlike most diseases that give us early warning signs, gum disease progresses silently, often without pain. Left untreated, teeth get loose and have to be removed. Surgery may be imperative to slow the disease process. Previous studies have also found the incidence of heart disease is about twice as high in people with periodontal (gum) disease. The chronically inflamed gums, associated in periodontal disease, is the gateway for bacteria in the plaque to enter the bloodstream, contributing to clogged arteries, and ultimately heart attack and stroke. Preventing and treating the disease in the early stages are the best ways to keep you and your smile healthy.